Jyll Bradley works in a broad range of media including drawing, photo-based studio works and large-scale public art projects. Her public projects often involve engagement from local communities, searching collectively for meaning in the idea of ‘place’. Light is an important protagonist in her work and she talks of using it to “bring things into the present”. For Folkestone Triennial 2014, Bradley presented Green/Light (for M.R. ), a major sculptural light installation created for the former Gasworks site on the junction of Ship Street and Foord Road North, Folkestone. Now redundant and inaccessible, the site was once a hub of energy and the place where electric light was first generated for the town. The creation of the installation has been an intense personal journey for Bradley, who was born in Folkestone in the same year that the Gasworks were decommissioned, but has lived her adult life as a successful artist in London. Green/Light (For M.R.) is an attempt to ‘square the circle’. 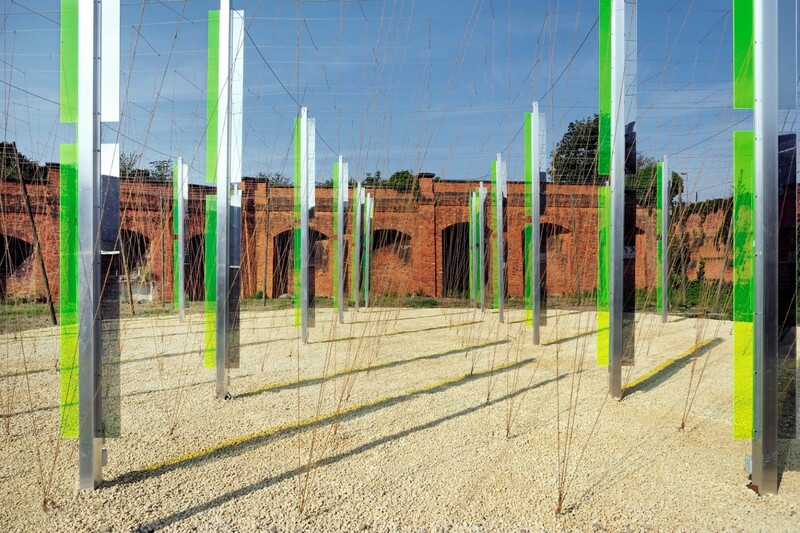 The outer square grid of the sculpture – built as a traditional hop garden with wooden poles, wirework and stringing – creates a webbed enclosure that represents her childhood in Kent. The inner circle of aluminium poles that shimmer with colour and gather light occupies the precise footprint of one of the original gasometers on the site, and stands for the energy and insight of her adult life. Green/Light (For M.R.) was made with the engagement of the local residents association and in close partnership with structural engineer Ben Godber. The sculpture’s exciting, immersive, reflective space invites the further regeneration of the site for the local community.